Blizzard Entertainment is a name well-known to any PC gamer; after all, they are the company that brought us the legendary franchises Starcraft, Diablo and World of Warcraft, each of which has sold millions of copies and are widely regarded as the top of their field in their respective genres, and they each continue to spawn dozens of competitors trying to copy their format and gameplay style. 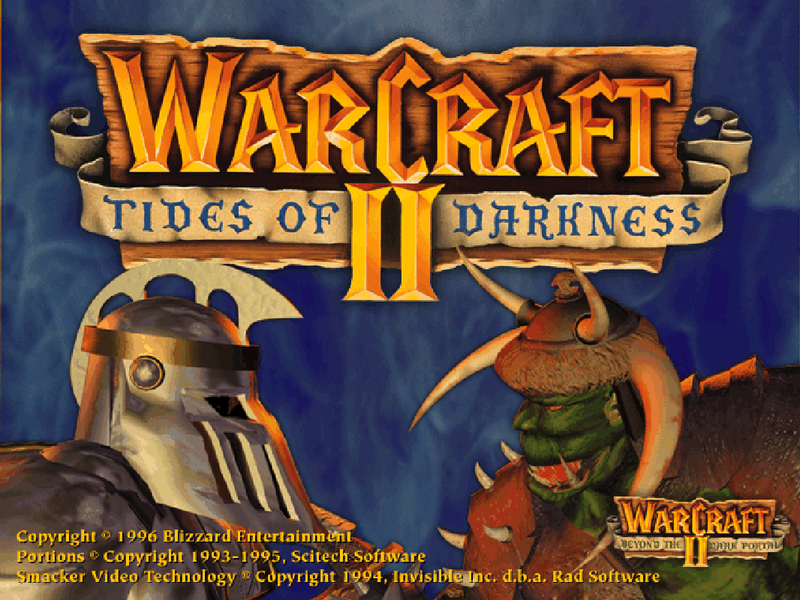 Arguably their first big hit, though, was a humble DOS title called Warcraft II. 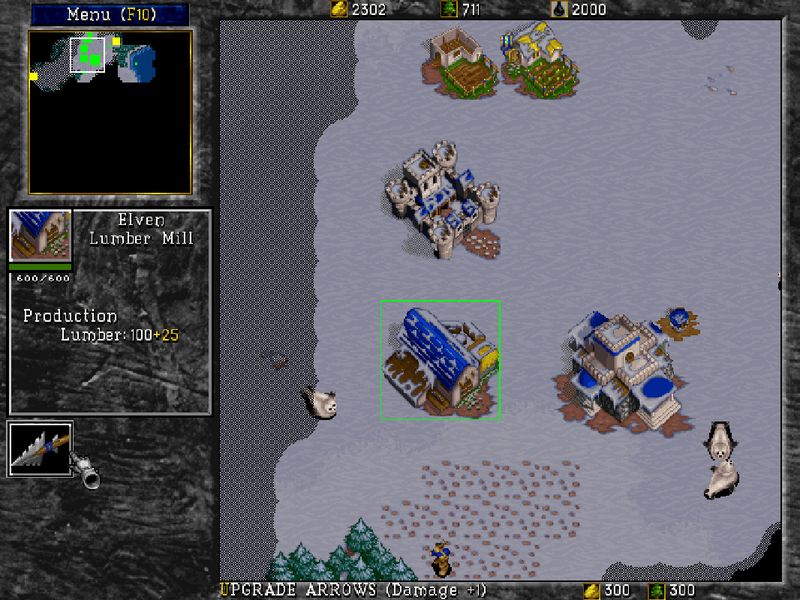 While it was not the earliest example of the real time strategy genre by a long stretch (the genre having its origins in early 80s titles like Utopia), Warcraft II and its rival franchise Command and Conquer were among the earliest games to popularize it. Warcraft 2 managed to introduce a few unique elements to the genre, though, as we will see. The first few missions of the game are pretty standard fare, generally just intended to introduce you to the game's basic mechanics and units, as well as the "tech tree" structure of the game's buildings. So you'll be doing basic things like establishing bases or building shipyards to capture oil patches on the sea. Of course, being an early RTS also has its drawbacks. Things like unit controls (assigning groups of units to a hotkey for quick access later) and queuing up unit contructions weren't introduced yet. Nor were things like automatically repairing buildings or healing units through spells - the player must always do these things by hand. Another drawback comes in the form of the "attack" command being somewhat unwieldy. If the player clicks directly on an enemy unit, all of the units they currently have selected will attack that one particular unit. However, choosing to attack an empty piece of ground, rather than causing all units to engage nearby enemies, will just cause each unit to pair off with another enemy unit and attack, with the rest simply standing idle. Not a very efficient way to do battle. Thankfully this is corrected in the Battle.net edition. 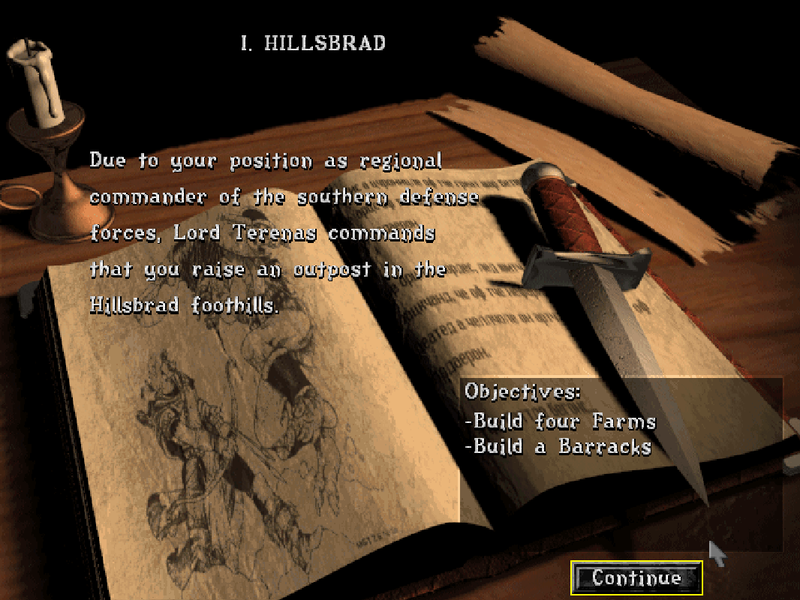 Unlike many other strategy titles of the time, the player also has multiple resources to manage in order to maintain their army, rather than just one. Gold and lumber are use to construct units and buildings (with only the most basic units not requiring the latter), while oil is used to build ships for naval combat - an integral part of many battles in the game. Later on other units begin to be introduced, including the Knights (faster and stronger footmen), Ballistas (long-distance siege weapons) and of course Mages, units which, while slow and weak in combat, can cast powerful spells that can lay waste to the battlefield, whether slowing down units, launching fireballs to damage groups of enemies, or simply laying waste to large portions of cities with a well-placed Blizzard spell. An especially tricky unit also comes in the form of the Submarine, a unit which is relatively fragile but invisible unless viewed with an air unit or another submarine. Used properly, they can sneak in and wreak havoc on unsuspecting targets and then vanish again while taking no damage themselves. As any RTS player knows, one of the main concerns of the game's developers is maintaining balance between each of the playable factions; after all, if one team is far more powerful than the other, then there's no reason to pick anyone else. 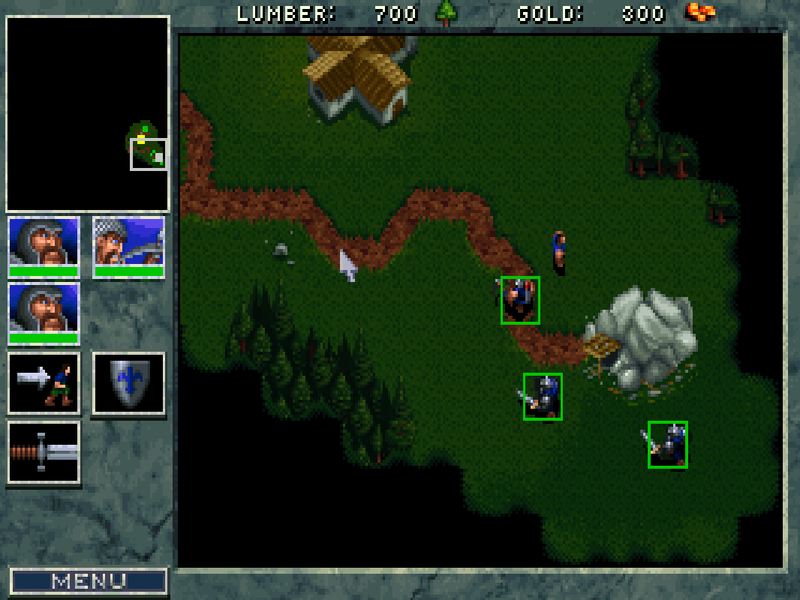 Warcraft 2 is no exception, though the way it does this is somewhat basic. Simply put, both sides are nearly identical in abilities. Orc grunts are functionally identical to Human footmen, having identical stats in every respect. The same is also true of Elven Archers versus Troll Axethrowers, Elven Destroyers versus Troll Destroyers, and so on. Functionally, the only real difference between the two races are some slightly different spells and upgrades - Elven archers get an extra damage upgrade while Trolls get health regeneration, for example. Ogre Mages can also cast Berserk (halving a unit's sustained damage while increasing their damage output) while Paladins can heal units and can quickly destroy undead units. Having clans that are essentially 95% identical may not be an ideal way to strike a balance, but it does its job fairly well. 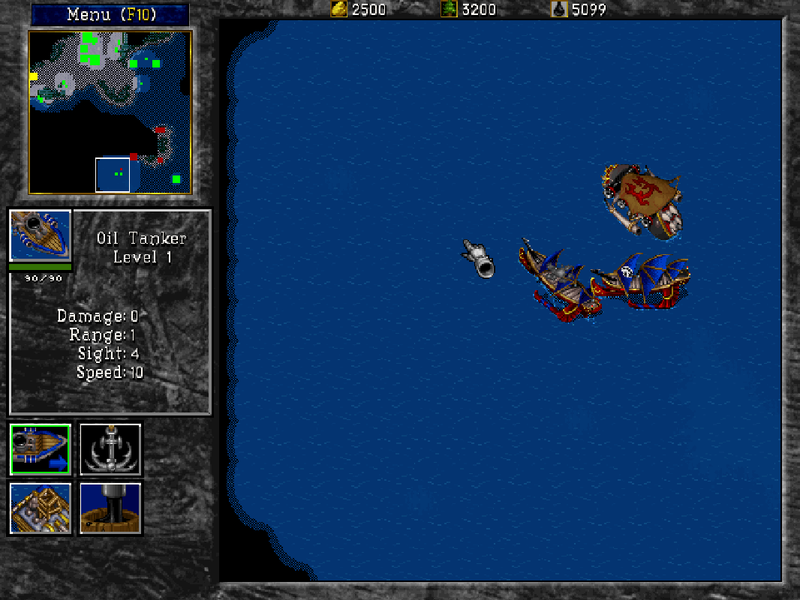 In conclusion, while Warcraft II's gameplay may be somewhat dated, it is a solid early example of the genre, introducing many of the key elements of Blizzard's RTS franchises. 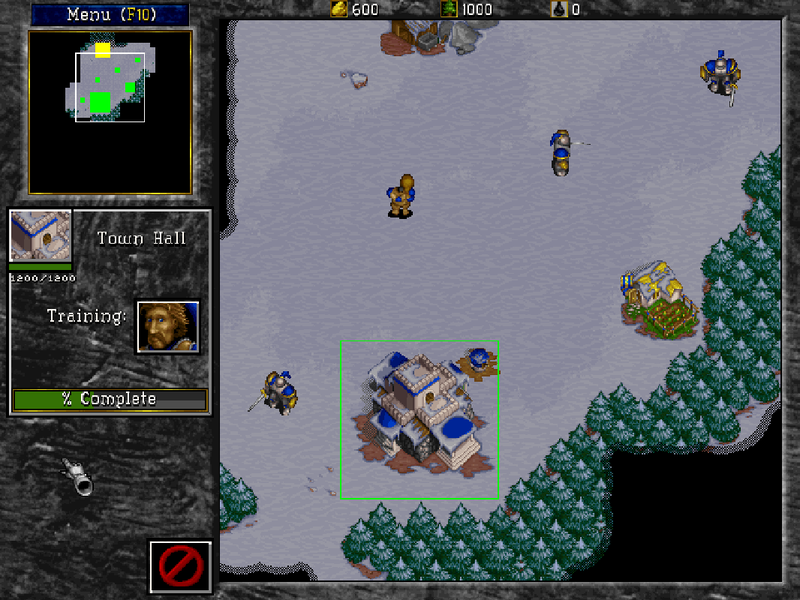 It may not hold up as well as Starcraft, but its simple yet charming aesthetics and gameplay make it an enjoyable experience nevertheless, and the fact that it was one of the earliest games of its kind to include a map editor (complete with customizable unit stats) lent it some considerable replay value. 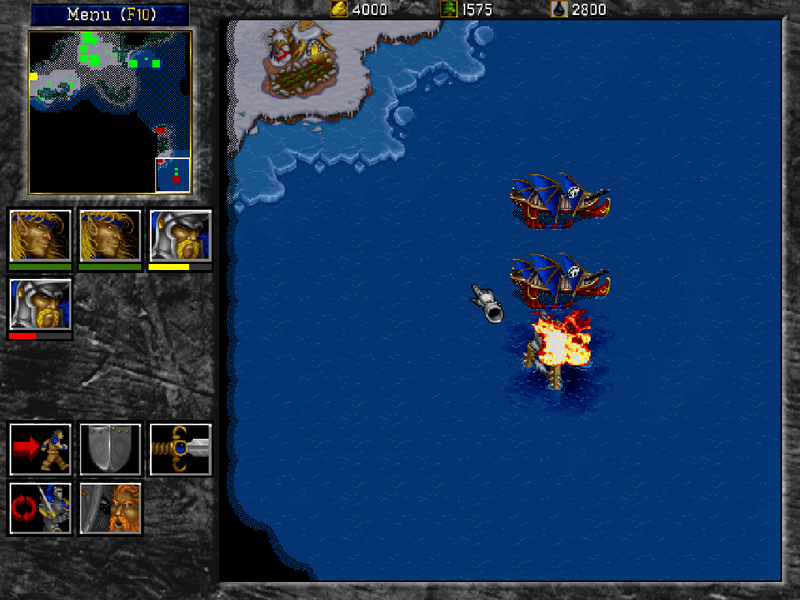 If you want to give the game a go today, I'd recommend tracking down a copy of the Battle.Net edition, which not only introduces some gameplay and interface improvements (including fixing the peculiarities of the Attack command, adding quick unit selection via hotkeys and showing a counter for the food resource on the HUD), but it also includes both the original missions and those of the game's expansion pack, giving you a lot more value for your buck. The game also did have the advantage of having online play over Battle.net, though I don't believe the servers for it are active anymore. 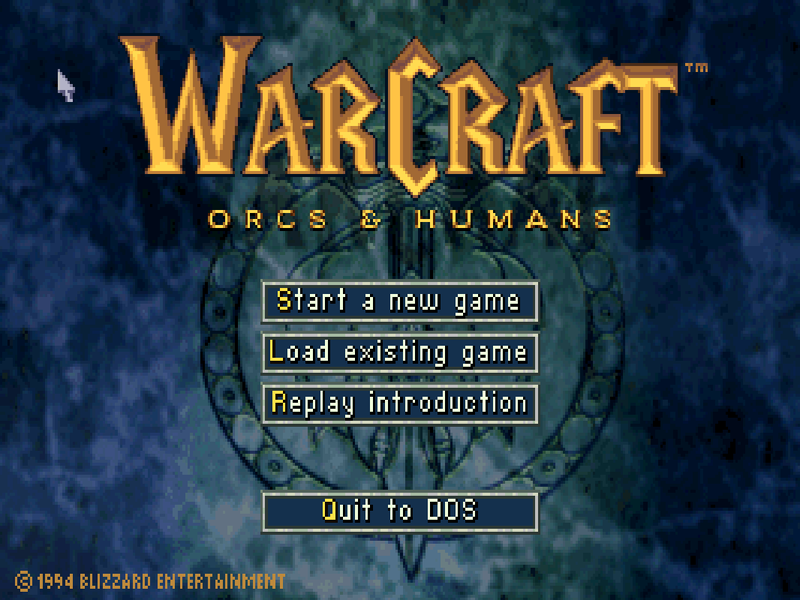 As a little bonus, I also decided to check out the original Warcraft, which I'd never played before. It definitely has't aged as well as its sequel, as I'll explain momentarily. For one thing, the game is extraordinarily slow to the point of being torturous; even on the fastest setting, the characters move across the map at a snail's pace and even mundane tasks like building a single farm seem to take ages. For another, the interface leaves quite a lot to be desired. There is no context-sensitive right clicking here; right-clicking simply recenters the camera on the point you've clicked. To do things, you must painstakingly utilize the keyboard or mouse to select a command each time you want a unit to carry out an action. There is also no click-and-drag mass selecting; instead, you must hold shift and click each individual unit, and even then only four units can be selected at a time. The game also lacks the polish of the later game, with all units on a team utilizing the same pool of voice clips. In short, Warcraft 1 just isn't much fun to play. Go for Warcraft II instead; it holds up a lot better.